After pig's head delivered to Ramat Hasharon synagogue, ministers and lawmakers say local 'anti-religious incitement' to blame. Lawmakers blamed local anti-religious activists after a pig's head was delivered to Ramat Hasharon's 'Sukkot Shaul' synagogue on Friday. "The placing of the pig at the entrance to the synagogue in Ramat Hasharon proves that the 'Religionization' campaign has turned into an incitement campaign," said Jewish Home MK Moti Yogev. "My father, who immigrated from Berlin on the eve of the Holocaust, certainly would not have believed that he would see such an anti-Semitic image here in the State of Israel," added Yogev. "The leaders of secular Zionism must do soul searching to see if they have not gone too far in their efforts to uproot the Torah from the hearts of their children." 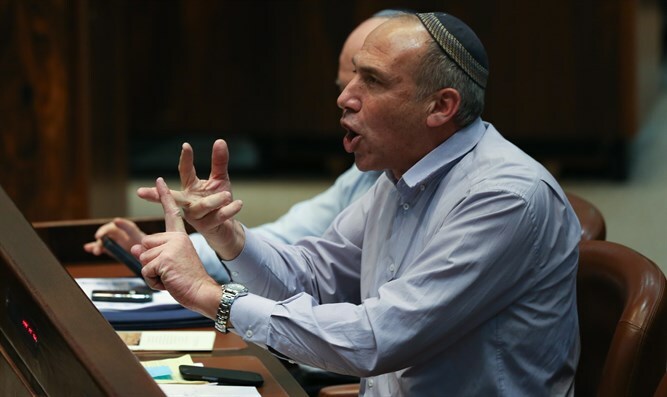 Deputy Defense Minister Eli Ben Dahan (Jewish Home) also blamed the anti-religionization campaign, saying that "at the 80th anniversary of Kristallnacht, anti-Semitism is also raising its head in the Land of Israel". "The ongoing incitement against the religious community in Ramat Hasharon was a stage in the form of the head of a pig placed in front of a synagogue. We have to stop it now. " Central Israel's affluent Ramat Hasharon city has recently been a battleground between the local religious community and secular activists. Contending that the religious are attempting to forcibly turn the city religious, the activists almost convinced the city to close the Hesder yeshiva, which has been operating for more than a decade. Worshippers in Ramat Hasharon were shocked upon finding the bloody head on Friday and summoned police, who opened an investigation.